is no ordinary “magician”. His approach is smart, engaging and always surprising. He is widely acknowledged as one of the top sleight of hand magicians in the world with smart, unique, and often hilarious presentations. Hollywood’s Magic Castle has awarded Carney more awards than anyone in their history, the only performer to win in every category. 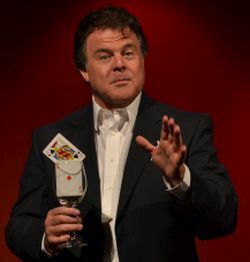 He has performed in casinos in Atlantic City, Lake Tahoe and Las Vegas. Television appearances include Late Show with David Letterman and the Jerry Seinfeld HBO Special, as well as feature appearances on Spin City and Two and a Half Men. He is an accomplished actor, with a number of plays and television appearances. He has served as spokesman for MasterCard, performing magic for their national television commercials. Carney embodies the state of his art, combining exceptional skill and creativity with pure entertainment.